Foxcatcher: True story? Fact and fiction in the Steve Carell movie about Dave Schultz’s murder. Mark Schultz, played by Channing Tatum (left), and John Eluthère du Pont, played by Steve Carrell, in Foxcatcher. This post contains numerous spoilers about Foxcatcher. On Jan. 26, 1996, John Eluthère du Pont shot and killed Olympic gold wrestler Dave Schultz on du Pont’s Foxcatcher estate in Newtown Square, Pennsylvania. Schultz, along with other wrestlers, had lived on the estate with his wife and children for several years while coaching and competing. His relationship with du Pont—and du Pont’s relationship with Dave’s brother, Mark, also an Olympic wrestling gold medalist—is the subject of Bennett Miller’s awards season contender Foxcatcher. How much do the book and movie differ? A fair amount. In the movie, John’s mother (played by Vanessa Redgrave), for instance, is portrayed as the driving force behind his insecurities, while in the book Schultz does not recall her being a significant factor in du Pont’s behavior. Most notably, perhaps, the movie makes no mention of du Pont’s diagnosis with paranoid schizophrenia, which, at his trial, was offered as an explanation for the murder. Below I’ve outlined other key differences between the story Schultz tells in the book and what we see in the movie. 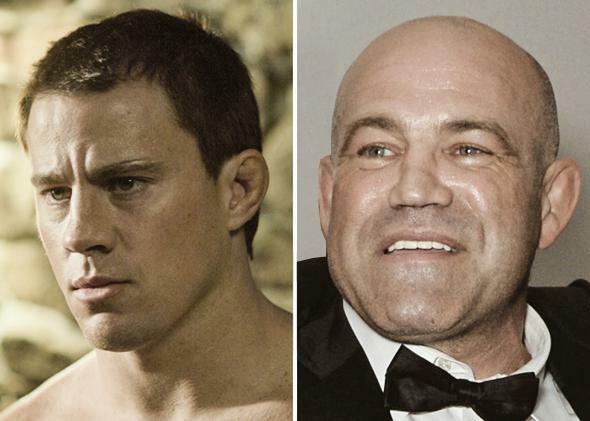 Channing Tatum (left) as Mark Schultz (right) in Foxcatcher. Photo by Sony Pictures Classics, David M. Benett/Getty Images for Foxcatcher. Steve Carrell (left) as John Eleuthère du Pont (right) in Foxcatcher. Photo by Scott Garfield/Sony Pictures Classics, Tom Mihalek/AFP/Getty Images. John du Pont’s backstory is largely left out of the film. He was born in 1938, the youngest of four children, to Jean Liseter Austin and William du Pont, Jr., descendant of the French writer and politician Pierre Samuel du Pont de Nemours. His paternal great-great-grandfather established a gunpowder mill in Wilmington, Deleware, and became “the leading supplier of gunpowder to the U.S. military,” Schultz explains. John’s father left his mother when he was 2, remarried, and started a new family. In a long profile written shortly after Schultz’s murder, the New York Times reported: “He was an achingly lonely child in a fatherless household who used his inherited fortune to buy what he did not have naturally: camaraderie, adoration, self-worth.” That fits the man we see in Foxcatcher, who insists on being called “coach” despite a complete absence of wrestling skills. 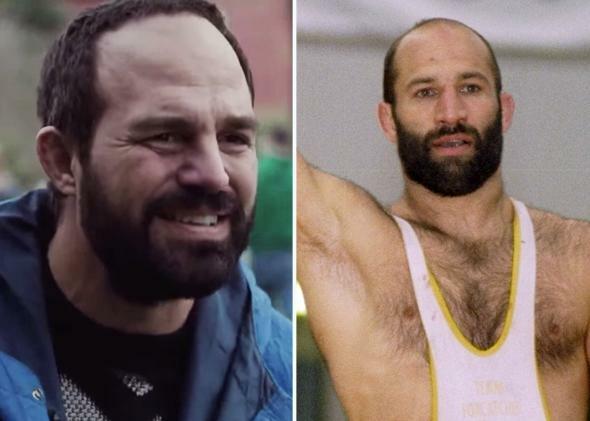 Mark Ruffalo (left) as Dave Schultz (right) in Foxcatcher. Photo by Scott Garfield/Sony Pictures Classics, Glenn Cratty/Getty Images. Mark’s older brother Dave was dyslexic. After getting teased for being in remedial reading in third grade, he threw the taunter on the concrete and cracked his skull. “After that, Dave became known as the toughest kid in the school,” Schultz writes. Dave would become Mark’s protector from bullies. In the seventh grade he took up wrestling, and his ability to spar on both sides equally meant opponents had trouble finding his weak spot. (Schultz, following the findings of some studies, suggests that his dyslexia and ambidexterity were linked.) As a high school freshman, he placed second in the World Schoolboy Championships in Peru. Wrestling came much easier for Dave than it did for Mark (who excelled in gymnastics), and though Dave never boasted about his success and even helped train his brother, Mark was resentful. “Down deep inside, I knew what my problem was,” Schultz writes. “My ego.” This sibling rivalry is a major storyline in Foxcatcher. In the movie, a mysterious man calls Mark and asks that he fly out to Foxcatcher to speak with John. While this is basically accurate, a few interesting details are left out: Schultz remembers a Stanford surgeon calling to alert him that John du Pont, whom the surgeon called a friend, would be getting in touch soon—the surgeon wanted to “vouch” for du Pont ahead of time. Du Pont called later that day, offering Mark an assistant coach position for the Division I wrestling program he was starting at Villanova. He had asked Dave first, who had just accepted the raise at Stanford and in turn suggested Mark. Schultz was not as easily won over by du Pont as the film suggests. He was concerned with du Pont’s apparent lack of wrestling knowledge, and it was a couple of weeks before he cautiously arranged to meet du Pont in Indiana where he was training for the Worlds. His first impression: “I stared at a loser.” Schultz was put off by du Pont’s unkempt appearance (his teeth were “dark yellow and caked with food”), and decided he was not interested in the job if it meant regularly interacting with du Pont. Du Pont assured him that in the media guide he would be referred to as “Coach,” but that he would only pop in to check on how things were going every once in awhile. Schultz didn’t agree right away, but agreed to talk after the trials. Schultz did not stay on the Liseter Farms estate, all expenses paid, when he arrived in Pennsylvania. He paid $800 a month for a one-bedroom apartment in a blue-collar neighborhood a few miles from the Villanova campus. For the first few weeks, du Pont stayed away from the offices, but soon he was stopping by constantly—and he was “always drunk or on drugs, or both,” according to Schultz. In addition to coaching at Villanova, as part of the deal, Schultz also became the second wrestler to join du Pont’s Team Foxcatcher. Foxcatcher implies that Mark looked up to du Pont when their relationship began. But Schultz recalls feeling pity and even disdain. Schultz does mention cutting du Pont’s hair at one point, as well as doing coke with him a couple of times. Du Pont did in fact shoot a documentary about himself at the time of the World Wrestling Championships in 1987, called Quest for the Best, which aired on the Discovery Channel. But it was Mark, not Dave, who was asked to say a few words on camera about du Pont being a great leader. He tried to put them off, but they were persistent: “I got drunk and then told them du Pont was great, blah, blah, blah. I was so drunk that they couldn’t use the footage in the final product,” he writes. As for the movie’s hints that there may have been sexual tension—or more than tension—between Schultz and du Pont, that doesn’t seem to have been the case. Schultz does recall du Pont “creating” a wrestling move called the “Foxcatcher Five.” “Basically,” he says, “it was him grabbing someone’s balls with five fingers.” Du Pont got the idea after hearing Schultz talk about a match in which he squeezed an opponent’s testicles for “a fraction of a second” as a last-ditch effort while he was pinned to the mat. When du Pont tried the “move” on Schultz, Schultz glared at him and du Pont took the hint. At one point, another wrestler nervously told him that du Pont had succeeded in pulling the move on him; Schultz expresses regret over not reporting the incident to the Villanova athletic director (and even compares it to the Penn State football scandal). In Foxcatcher, during the qualifier for the ’88 Seoul Olympics in Pensacola, Florida, an emotionally defeated Mark retreats to his hotel room after losing the first of three matches against Rico Chiapparelli. There, he smashes his head into a mirror and binges on hotel room service, only to be inspired by his brother to do a crash workout so he can lose 12 pounds in 90 minutes and come back to win. Did this astonishing feat actually happen? According to Schultz, yes—the biggest difference from the film being that it was his good friend and then-coach at Virginia State Hal Miles who gave him the much-needed pep talk, not Dave. Dave, who was also there to compete, was right by his side to encourage Mark, however, as he sweated it out in front of a small crowd of cheering onlookers. “That was the most weight I had ever lost in so short a time,” Schultz writes. 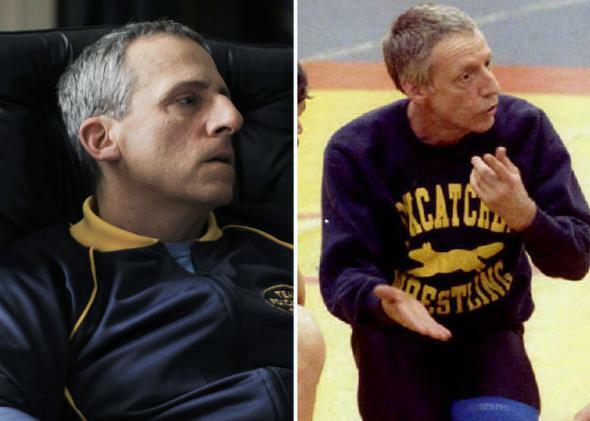 Foxcatcher paints the decline of Mark’s relationship with John, and his ultimate decision to leave, as largely stemming from Dave taking over as coach. In reality, Dave never worked at Foxcatcher while Mark was there, and Mark was fired shortly after an angry confrontation with John over not much, apparently; he says he was never given an explicit reason for his firing. Desperately needing to participate in the Worlds and with few financial options, Schultz reluctantly worked out a deal with du Pont to keep training with his workout partner Dan Chaid. This meant moving into the chalet on du Pont’s farm, rent-free. The Villanova program, which Schultz described as “doomed from the beginning,” folded soon afterward. Schultz competed in the ’88 Seoul Olympics and claims to have let his opponent win during his final match: “I could not give du Pont the credibility and status that would come from his team’s producing an Olympic champion.” In the film, Dave makes a deal with John that if he stays on coaching at Foxcatcher, Mark must get paid as well. A similar deal occurred in real life: If either Schultz was competing on Du Pont’s team, both got paid. In 1989, a few months after Mark departed from Foxcatcher for good, Dave accepted a job coaching at Foxcatcher; that deal was still in place. Dave, his wife Nancy, and their two children lived in a house far on the edge of the estate. The film isn’t explicit about the amount of time that passes between Mark’s departure from the farm and Dave’s murder, though a viewer is likely to assume that perhaps only a few months have passed. In reality, Dave lived at Foxcatcher for roughly seven years before the murder, finding more success as a wrestler and making plans to complete at the ’96 Summer Olympics. Schultz doesn’t claim to know exactly why du Pont killed his brother, but he does note that the day it happened was the birthday of another wrestler training at Foxcatcher at the time, Valentin Jordanov. Jordanov, Schultz says, had likely replaced Dave as John’s favorite; Dave was said to have corroborated a police report filed against du Pont made by a fellow wrestler, thus falling from du Pont’s good graces. “I believe that du Pont had a birthday present he wanted to give Jordanov that would demonstrate how much du Pont loved him,” Schultz writes of his possible motive. Schultz’s account of what happened, as far as he knows, is similar to what we see in the movie. Pat Goodale, du Pont’s security expert, was in the car when du Pont shot Dave three times; like his onscreen counterpart, he did nothing to stop him. Goodale testified that when he pointed one of the two guns he was carrying on du Pont, du Pont pointed his own gun back at him. Schultz says he still doesn’t understand why Goodale didn’t stop du Pont from firing the additional shots, but doesn’t blame him, either. After the shooting, du Pont drove back to the mansion alone, and walked into a bomb shelter his mother had installed. He remained in a standoff with the police for 48 hours before surrendering. In the book, Schultz describes many bizarre stories he heard from Dave and others about du Pont’s increasingly erratic behavior. Du Pont believed there were spirits and spies in the mansion, he “ordered treadmills removed from the training center because he believed their clocks were transporting him back in time,” he communicated with rocks. Schultz also mentions stories from earlier in du Pont’s life, including a time when du Pont drunkenly drove a tank he owned (like the one we see John purchase in the film) onto a police officer’s property. “His behavior was usually dismissed with ‘That’s just John,’ or attributed to alcohol and cocaine use,” Schultz writes. None of this is mentioned in the film, though one moment when John enters the Foxcatcher gym with a gun while the guys are training echoes an event Schultz describes. The Times profile of du Pont mentions a series of additional disturbing behavioral stories. Expert witnesses identified the heir as a paranoid schizophrenic. He was convicted anyway, and died in prison in 2010. Correction, Nov. 17, 2014: This post originally misstated that Foxcatcher is based on Mark Schultz’s autobiography. The movie is inspired by events detailed in the book. How Accurate Is Lone Survivor? How Accurate Is The Wolf of Wolf Street? How Accurate Is Captain Phillips? How Accurate Is American Hustle? How Accurate Is 12 Years a Slave?